Total privacy is yours in this stylish two bedroom Villa with ensuite baths. Sip your coffee out in the covered lanai or sunbathe in privacy in your oversized screened patio overlooking a secluded preserve lot. This special home with a west facing view is over 70 feet from the preserve making for spectacular sunsets and no neighbors behind you. Neutral colors accent this light and airy home that features an open floor plan with vaulted ceilings, a great room with custom built wall unit complete with mirror and glass shelving along with accent dimmable lighting to set the mood. Your upgraded kitchen has granite counters, brand new stainless appliances, and plenty of cabinet space. The master and guest bedroom both have walk in closets with built in organizers. More extras include central vacuum system, hurricane shutters and a large cage screened lanai. This home is poured concrete and reinforced steel construction, built by DiVosta Builders, meeting all Florida hurricane building standards. Villagewalk is a award winning Resort style community that has a Clubhouse with event and meeting space, 6 har-tru tennis courts, geo thermal heated resort pool and lap pool, fitness center, gift shop, hair salon, gas station, and restaurant. As a resident you can enjoy all the unique features that Villagewalk has to offer. 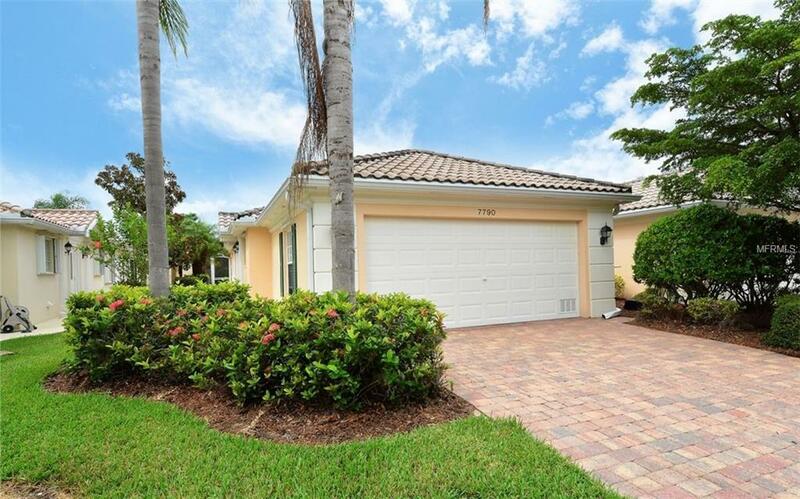 Located in Palmer Ranch close to shopping , dining, doctors and Siesta Key Beach. Come visit this beautiful home and join the Villagewalk experience.